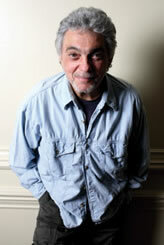 Around 1986 I had tickets to see Steve Gadd play a drum clinic at a venue called “Blazers” near Windsor but Steve, who was still in his forties, had to pull out after having a blood clot. I was so disappointed, not because I was not going to have the chance to see one of my favourite drummers live for the first time, but because there was a chance nobody would get to see Steve Gadd play or record again! 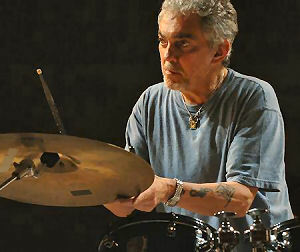 Steve Gadd is one of, if not the, most influential drummers of the past 40 years – everybody wanted to play like him or would have there favourite track that he had played on (mine was Chuck E’s in Love with THAT fill). Luckily for all of us, and a new generation of younger drummers, Steve did something about his lifestyle and now has been in recovery for over 23 years and has gone on to record and play with so many more great artists. I have had the honour to meet and spend some time with Steve a few times over the years and what amazes me the most is how humble and respectful he is about everyone – he always has time for everybody and is interested in you. 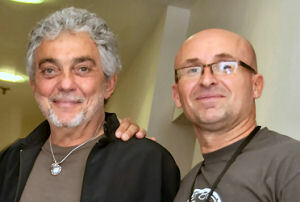 This was very clear on the Steve Gadd European clinic tour, earlier this year, where he made sure he met everybody who has made the effort to come and see him. Sometimes he could be signing for up to two hours before his show and always with a big smile. It is documented what Steve has played on, how he has played and what he plays, but as I have had the honour to get to know Steve personally over the past few years I wanted to do a piece on the man himself, what makes him tick, why and how exercise has become a big and important part of his life. In this interview Steve talks honestly about the reality of his life. First question would be; when I was growing up, my first major influence was when I saw Buddy Rich play live, I was 15 years old. Who inspired you and made you think this is what I want to do? I remember living with my grandparents and seeing a red parade drum. My uncle who was in the army was going to play at a Memorial Day Parade, I’ll never forget seeing that drum. I was three years old and I was hitting everything in sight. 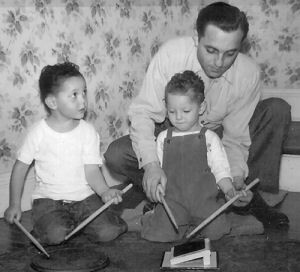 My uncle got me a pair of sticks and showed me how to hold them and I played along to John Philip Sousa records. Then at night when the whole family were together my uncle would get some sticks and play with me, so that’s how I started. After that he started introducing me to Gene Krupa, Buddy Rich, Louis Bellson and Art Blakey records. I was blown away; that sound that was coming from the drums just got me, but I saw the heard the drums first. I then started playing with records and then the longer I stayed interested the more they kept feeding me things to do. My family was a real supportive family and supported me all the way, introducing me to lots of music. I was lucky because I learnt my trade in the studio. I could be doing 3 to 4 sessions a day and then play live in the evening. When recording, I would play a track then come into the sound booth and listen back to myself – you soon learn to hear what works and what doesn’t. You’re a keen runner like myself. What got you into running and why do you think it’s important? My wife got me a membership to this gym because she wanted to start working out and I was dragging my feet, but she got me the membership and I was there and one of the trainers that worked there recognised me because he had played drums years ago and so he volunteered to train me. You have to get a little crazy to discipline yourself to do exercise but I guess that’s the way I am, once I get into it then I really get into it. I was getting up early and going and I was doing the Stairmaster and doing light weights, I did that for a few years. On the road it got difficult a lot of times back then to get to the gym, some of the hotels didn’t have a gym or we would be sleeping on the bus. This was the early 90’s. I went on tour with Paul Simon in 1991, ”Rhythm of the Saints” Tour. I was going to the gym, because those hotels were pretty cool when touring with Paul, and one of the percussionists from Brazil was into exercising so we started running outside. That was the first time I ran outside, I loved it. It was great to get outside and get out of the gym and see different parts of the cities that you’re in and get out and get some fresh air. I used to find some great runs near canals or rivers, through parks, you really get to see some beautiful places. 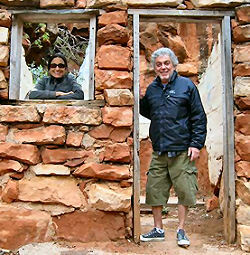 He and I did it together and we kept each other going. I really started to love getting outside. I started running outside at home, as it started to get harder to go to the gym because of work schedules, it just seemed to be a no-brainer; just take your shoes and clothes on the road with you and you can run wherever you are. I wouldn’t call myself a runner as I am too slow but I jog (ha, ha! ), I just find my pace and I stick to it. I guess that were being a drummer comes in, if I see somebody running in front of me I don’t speed up or slow down I just stick to my pace. When you’re out on the road would you say fitness is your main form of entertainment? I like to get out, it’s important for me to exercise. I’m in recovery so I always go to my meetings, and I am very disciplined about that as its important, more about meetings than exercise. I’m coming up 23 years now in recovery and I still believe they”re important. Some tours I’m with people who are in the programme and we’ll do things together, sometimes when we’re out of town it’s a cab ride. Those are the things that are important to me, meetings, exercise, talking to home, eating right, getting enough rest. The road is not easy and travelling today can be a nightmare on planes, it can be very stressful, so it takes it toll. I don’t want to be out here working hard and partying and then going home to the family and having to just crash for a week to get back in shape, I want to be able to go home and spend time with the family. So how many miles would you put in? I try to run every day. Sometimes I do six miles a day but I might go through a period where I am travelling and it would be a little bit tricky, we had long bus journeys at night so when I got off the bus in the morning I had to go back to bed and by the time I woke up it was too hot to go out so I went thought a period where I wasn’t able to do it consistently. I have learnt to listen to my body over the years and knowing what your body can do and when you need to rest. I have also been lucky not to pick up any major injuries. What are some of your favourite running places around the world? You know what its like; you end up remembering places to run from before, or it’s a new place you ask around. I love running around parks and along rivers. As you know I have run around Hyde Park and Regents park while I’m here in the UK. I like that run, I love Central Park in New York. Do you have any music playing when you run? No. I have some things that I think about, spiritual things, just to try and stay centred, spiritually. You know what it”s like, sometimes it’s nice to just get out there on your own and think about things. Do you find it’s helped your drumming and being on the road? I think it helps everything, it keeps me on a ready level for different gigs that come up. I feel it helps if I’m off from playing and I’m not practising as much as I could the exercise helps me when I start back up again I get back in shape quicker. It keeps the blood flowing, if I stop playing and I stop drumming, it’s like everything stops moving and it’s hard, you start to get tight. I think that is getting old, what happens is there’s definite aches and pains that happen naturally when you get older and you can either give in to them and stop moving which I don’t think is healthy. I think you’ve got to accept this and try and exercise through them and that’s what allows you to keep moving. If I exercise between tours, even if I’m not playing drums a lot, when I do pick up the instrument again the exercise that I did while I wasn’t playing makes me get back quicker. Do you have any form of diet that goes with this, are you careful about what you eat? I am because you get older and I can’t eat the same stuff I used to when I was young. I love pasta and I love bread but I don’t eat that much of it. Being a drummer, we sit down and play and if I put on weight it’s not comfortable, I feel better light. I feel like my breathing’s better when I play, my clothes fit better, all of that stuff has an effect on me when I’m playing, if my clothes don’t feel comfortable I don’t like it, I’ve got to feel comfortable and relaxed. So when you’re out on the road and you’re spending half a year out on the road, how do you cope with your exercise, how do you manage to fit that in? That’s one of the first things I try to do every day is try and get a run in. I don’t set myself up to fail, sometimes I can run for an hour and that’s what I’ll try to do but if I can only do 20 minutes, I’ll do 20 minutes. I won’t tell myself ”Oh, man I can’t do the whole hour, I’m not going to do anything”. I think it’s better to get out and do something, you can go out and do 10 minutes, if you can go out and walk for 20 minutes it better than not doing anything. I can’t set myself up to fail. I try not to eat a lot of sugar. I try and drink enough water, it’s important to drink water. I have to work at doing those things, it’s not something natural. I still drink coffee. I like Starbucks. You can’t give up everything, I’ve done coffee to the point where I’ve been doing too much and I’ve cut it back. Occasionally I’ll have a plate of pasta, and occasionally I’ll have an ice-cream but I try not to do it a lot. I find what happens if I stay away from it long enough I don’t crave it as much. When I open the door and have some of this stuff then I’m craving it the next day. Sugar is a funny one, it can make you want more and more. But then it is also important for what you do to have in moderation, sugar, a good balance of everything. I use vegetables or carbohydrates, fish, chicken, protein, egg whites but I don’t go out and eat at these special restaurants just for the taste because I don’t need that, I enjoy that kind of food but I use it more for fuel than taste. Do you find its easier now though? I’ve been running since I was 17/18 years old and I’m 47 now, when I first started there wasn’t the gyms in hotels and it was harder to eat properly then. Do you find it easier now when you’re on the road. When you’re doing Eric Clapton you know everything’s going to be laid on, everything’s going to be nice but then when I saw you recently at Ronnie’s; I would imagine it’s lower scale. You’ve got to pick and choose, just try not to eat the potatoes, try to eat the vegetables without a lot of sauces, I like to eat simple because the heavier the stuff is the more tired I am after and I’ve gone through those periods when I was growing up where I ate big family meals and it was great but when I was finished I was ready to sleep and I wasn’t exercising then. I didn’t start exercising until I was about 40 years old or older. What I found with exercise is it’s really important, you don’t realise how important it is, just to keep everything flowing, keep the circulation, helps your digestion, it helps keep everything moving. When we stop moving on the outside, things stop moving on the inside and that’s not healthy. I think also what I find, you feel more motivated, your head feels clearer, you’ve had a good clean out. It’s not always easy to do it, there’s a certain amount of discipline. There are certain times, I can read my body better now, there are days when I know I feel tired where a light run will make me invigorated, then there’s other days where I feel tired in a way where any exercise I do is going to deplete me, you just get to know. For me, I like it, it’s important, for me exercise is just as important as practising and I think it helps if I’m not playing, it helps when I do pick up the sticks and go back to work. If I’ve had a couple of weeks off and I haven’t practised and I ran every day or 4 or 5 times a week, I could come back quicker. I wouldn’t try to start where I left off playing. It’s just like running, if you take time off running, you can’t go back and try and do the same 5 mile run the same speed you did a month ago, you can’t do that. I’m not training for a race, I’m just doing this for health. You’re very family orientated, how do you keep that going when you’re on the road? I talk to my wife a minimum once a day, sometimes twice, stay in touch with my kids. I met my wife in the business so she knows what the business is like, we trust each other. Sometimes, when we first got together she travelled with me a lot, then when we had kids she wasn’t able to, although there were times when I brought my kids on the road. If I was in one city for a length of time I had the family come out, now my kids are grown so she’s able to travel a bit more. When I go home I try to bracket that time and let it be family time, I like living when I’m not working, when I go home me and my wife do everything together, if she goes grocery shopping I’ll go with her, if she goes to the gym I’ll go to the gym with her. We have five dogs. I live in Phoenix, Arizona; we have a nice enclosed backyard. Thanks for your time and drumming over the years. Steve Gadd is maybe the only studio musician I know where I like what he did to the music on every recording I know of his. He seems to be able to play everything with such ease and sensibility and always makes the right musical choices but he also is a marvel to witness live. I will never forget the concert where he played with Michel Pettruciani in Munich and I was able to watch and hear him up close. He had such a beautifully balanced sound that mixed so well with the band and the overall acoustics of the room. He is the master of context. He sounds so good because of what he does and how he does it in the right moment. True genius is when you can turn simple things into wonders. He sometimes plays things that are easy to understand but they make such a big effect emotionally… that it makes you think… how did he come up with that? And why didn´t I? …these are just some of the things that he does. Only when you know how much it takes to be able to do that – only then you know how good he really is. 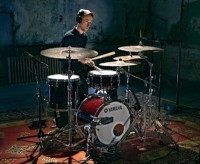 He is the true master and will always remain one of my favourite- not just drummers but – musicians. Steve and I became close friends. At the time he was switching between SD2 and SD4 sticks so I said “What if we homogenized both?”. We fed the specs into the computer and what came out? 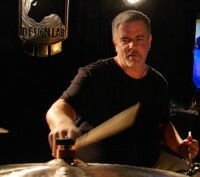 The Steve Gadd model. I think it was the first time anyone had seen a barrel shaped tip. As for the black, his drums were black and he dressed in black so when he said “How about black stick?” we did it. The stick was probably the first example of brand power in the drumstick business – it was also the most expensive. The price was going to be $10 when all of the other sticks were $6. I did not expect them to sell well expected them not to sell very well. Wow, were we surprised – we couldn’t keep up with the demand! It was totally unexpected.